Recently, Visionox confirmed that they will work with Xiaomi to develop foldable screen phones and support delivery of AMOLED screen according to Xiaomi’s requests. Back to January 23, 2019, LIN Bin (林斌), the vice president at Xiaomi, posted on his Weibo account that Xiaomi has developed the first foldable screen phone and the world’s first double-folding phone. He also posted a video showing how the foldable phone looks like and explaining the technical challenges with creating flexible screen technology, four-wheel drive folding shaft technology, flexible cover technology, and MIUI adaptation. Interestingly, soon after LIN’s Weibo post, FAN Junchao (樊俊超) posted a moment on WeChat saying Xiaomi doesn’t have the core technology to develop foldable screens and they just bought non-yet delivered foldable screen prototype from others. Later LIU Zihong (刘自鸿), the CEO of Rouyu (柔宇), shared the screenshot of that moment on Weibo saying “When they go low, we go hard. (in English). We will not attack unless we are attacked; if we are attacked, we will certainly counterattack no matter of what it costs. (in Chinese)”. It needs to be noted that LIN’s words might lead readers to think that Xiaomi has developed the foldable screen technology, however, its common for phone manufacturers not to develop or manufacture phone screens on their owns. For example, Huawei’s screens are supplied by BOE Technology Group (京东方) and Apple’s screens are supplied by Samsung and LG Display. 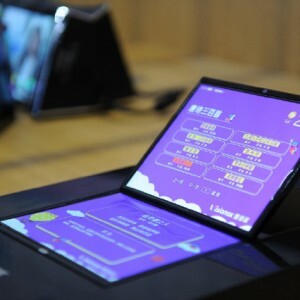 According to Strategy Analytics, a market research company, the shipments of foldable screen phones are expected to reach 700 thousand, in 2021 and 2023 this figure is expected to reach 30.4 million and 50.1 million respectively. Phone manufacturers may get attracted by the future trend of using foldable screen photos, many started to work on foldable screen phones and launched their delivery plans. Suzanne de Silva, Samsung’s director of product strategy and marketing, said the folding smartphone will use the Infinity Flex display and will be launched in February 2019. Huawei will introduce a foldable screen phone at the Mobile World Conference (MWC) that will be held in Barcelona on February 24th.